Four years after a federal grand jury in Raleigh, North Carolina returned a two-count indictment against James Alan Rowan for his fraudulent wind turbine investments, the fugitive was caught in Saskatoon, Saskatchewan. According to Saskatoon’s Star Phoenix newspaper, Rowan was captured at his parent’s home and held for extradition to the United States. The Grand Jury for the Eastern District of North Carolina indicted Rowan of Mag-Wind and Enviro-Energies for wire fraud and securities violations in the fall of 2013. Though physically located in Grimsby, Ontario, Rowan’s companies were registered in the United States. That small detail could send Rowan to prison in the United States for two 20-year terms. Rowan’s arrest doesn’t yet bring this sad saga of hype and bluster to a close. His attorney has 30 days to appeal the decision of Canada’s attorney general. If Rowan loses his appeal he will be extradited to the United States to stand trial. Once touted as a reincarnation of Alexander Graham Bell--one of Canada’s most illustrious inventors--by no less than the Globe & Mail, Rowan ensnared clueless talk show hosts Ed Begley Jr and Jay Leno as well as numerous investors in his schemes. At one time Rowan and his inventions were the talk of Toronto. I was there at the time and remember it painfully. I’ve written about him and his “product” in the past and these accounts are in two of my books as a warning to inventors and those who would be lured by the siren song of such shysters. I first became aware of Rowan and Mag-Wind in early to mid 2006 when I received the first plea for my intervention to stop “his fraud” on Ontarians hoping to get rich quick with his magnetically levitated rooftop wind turbine. Even some of the people selling his “investments” implored me to step as if I was some kind of wind energy Carrie Nation who could barge into his “shop,” swinging my axe. A photographer at one of the regional newspapers described his disbelief to me when he confronted the newsroom with one of my articles decrying this latest in a long line of wind turbine hustles. Everyone in the newsroom yawned despite his efforts to warn them this scam was taking place right under their noses. The local city council even approved a city ordnance to permit wind turbines on rooftops so they could help this budding Canadian entrepreneur. Who needs real wind turbines when Jim Rowan’s magnetically levitated, pyramidal contraption would do it all with less hassle and for less money. The indictment charges that Rowan aggressively marketed his “wind turbine” on line and sought the endorsement of Hollywood celebrities such as Ed Begley Jr. and Jay Leno. 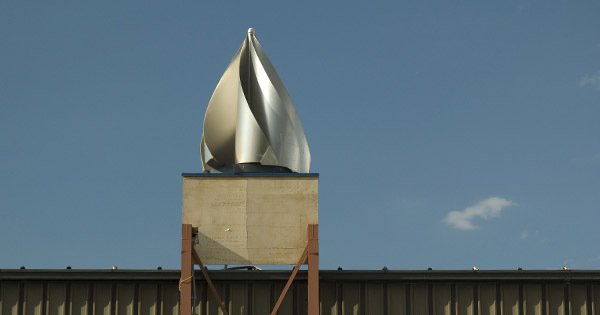 You can still view Youtube.com videos of Begley touting Rowan’s Enviro-Energies vertical-axis wind turbine and one of the devices being installed on Jay Leno’s warehouse in the Los Angeles area. Rowan is accused of false and deceptive claims, including exaggerating the performance of his inventions, falsifying scientific and technical information, and misleading investors about his ability to manufacture the devices. If convicted, Rowan will be one of the few wind turbine con artists ever to serve time in the four decades I’ve followed the industry. Most simply abscond with the money and are never heard from again. In the end Rowan, was a small-time hustler. More damaging to the wind industry and the energy transition so desperately needed are the sophisticated and professional cons that are careful to never quite step over the line into illegality. They raise hundreds of millions to Rowan’s millions. They win the endorsements of Governors, not reality TV stars. They draw in millions in subsidies and “loans” from state and provincial governments not merely a puff piece in the Globe & Mail. These hustlers and charlatans are rarely called to account and they never go to jail. For more on this device see Mag-Wind.